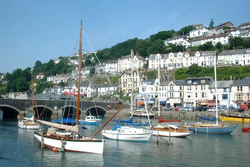 Welcome to the Official website for Looe and South East Cornwall. If you are looking for accommodation, events, activities, or just a chance to relax in Looe, Polperro or any other part of South East Cornwall, start here. Looe Sailing Club was founded in 1934 and soon established itself as one of the leading sailing clubs in the south-west of England producing numerous top quality sailors competing locally in some of the most popular dinghy classes in the UK, as well as many national sailing champions. Over the years, youth sailing and regular well organised training programmes have attracted sailing families throughout the region to the Club. Situated in Cornwall and featuring an 18 hole, par 70 course. Includes scorecard, green fees and directions.